One of the world’s most creative and original freestylers, Bartłomiej “Kala” Rak is not only known for his incredible breakdance-inspired combos, but also for his unique views on the freestyle world. We get an exclusive look at how the reigning Polish champion thinks the sport can improve, and also how the art of breaking has changed the way he approaches freestyle. In a sport like freestyle, where creativity plays such a massive role, it’s important to note that the possibilities are endless. While its increasing popularity and difficulty would suggest that new levels and moves are being discovered on a daily basis, the truth of the matter is that they were always there to begin with — we just needed a little help from some pioneers to show us what can be done before our very eyes. These pioneers, who most of the time have developed hard-to-replicate styles and an abundance of signature moves, have creativity as their biggest asset. 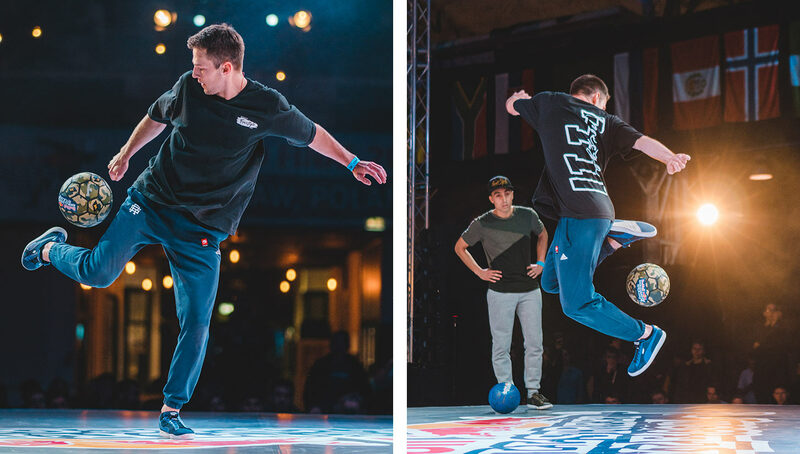 Many would argue that these are the most enjoyable freestylers to watch as they are unpredictable and constantly innovating. 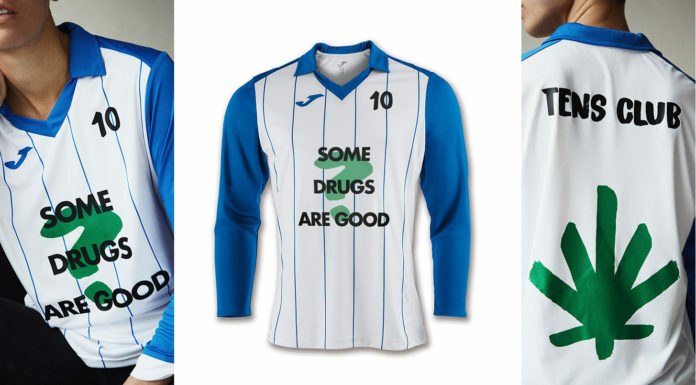 Bartłomiej Rak, better known as simply Kala, is certainly someone you would put in this kind of bracket. ‘Kala’ represented Poland at the RBSS finals in Warsaw last year. Photo by Tom Folan. 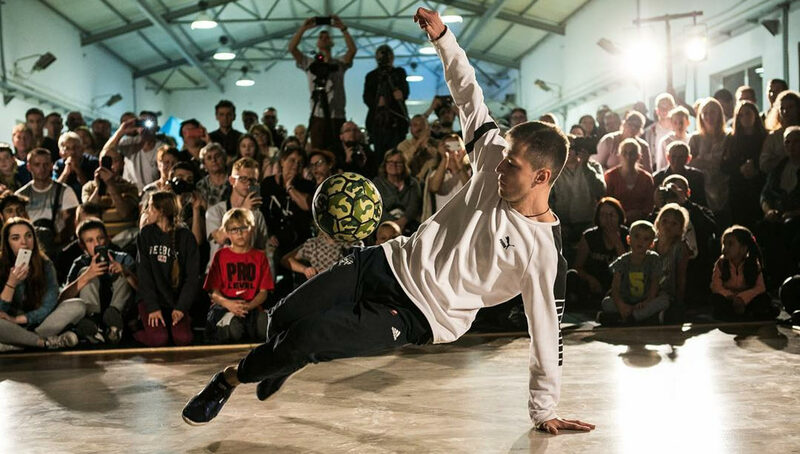 The Polish international has been keeping things fresh in the freestyle world for many years now, and he’s best recognized for his breakdance influence and incredible flow. The guy has more originality in his big toe than most freestylers in their entire bodies these days. Like many others, Kala’s freestyle journey began with the classic Nike “Joga Bonito” commercials. 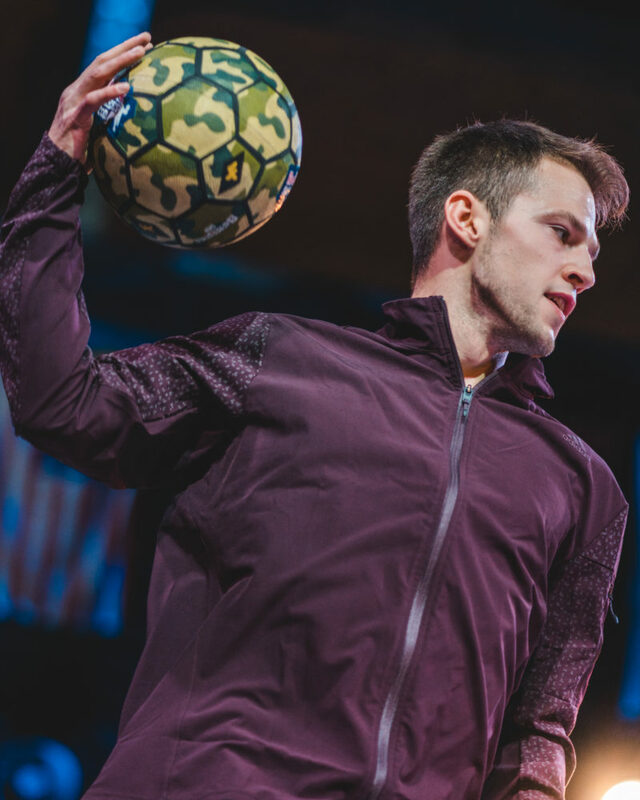 He soon discovered the budding Polish freestyle football community in 2008, which led to him transitioning from trying skills on the pitch to creating awesome sequences of movements for his own interest. The origin of his stage name is a bit less of a traditional story, however. “Kalaputa” was a nickname given to him by one of his old math teachers — no one else had or did call him this. He then registered for a Polish freestyle football forum using this name as a joke but somehow it stuck, and now shortened to just Kala, everyone in the freestyle community probably only knows him as this and not his full name! Now at 26 years of age, freestyle has become his full-time job. He has put in a lot of work with Poland’s R-Style Crew to make it happen, but he’s also a movie editing student on the side. If you are unfamiliar with Kala then you might have this image in your head by now that he’s one of those dudes that locks himself away in a room and creates new moves and posts them on social media for the world to enjoy. While that is true to an extent, he’s actually a very present figure in the realm of competition and brings those crazy creations with a heap of stage presence and attitude to boot. It’s fair to say he has now established himself in that elite bracket of freestylers that Poland has been notorious for producing over the years. We sat down with the supreme talent, getting an exclusive look at his views on the current format of freestyle competitions, how breakdance has contributed to his originality, and what is up next for his already storied career. 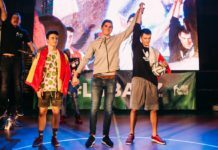 Last year, Kala won the Polish National Championships, subsequently getting to represent his country in the Red Bull Street Style World Finals which just so happened to take place in Warsaw. A fan favorite throughout the competition, Kala is the first person to acknowledge what it means to accomplish that in his home country. But reflecting on this series of events then leads Kala to make no secret of his firm and some might say radical opinions of competitions for their structure and culture. 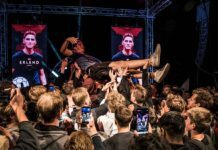 Citing the location, people around him, and the no time limit setup, Kala said that he enjoyed the Polish national championship more than he did the World Finals. 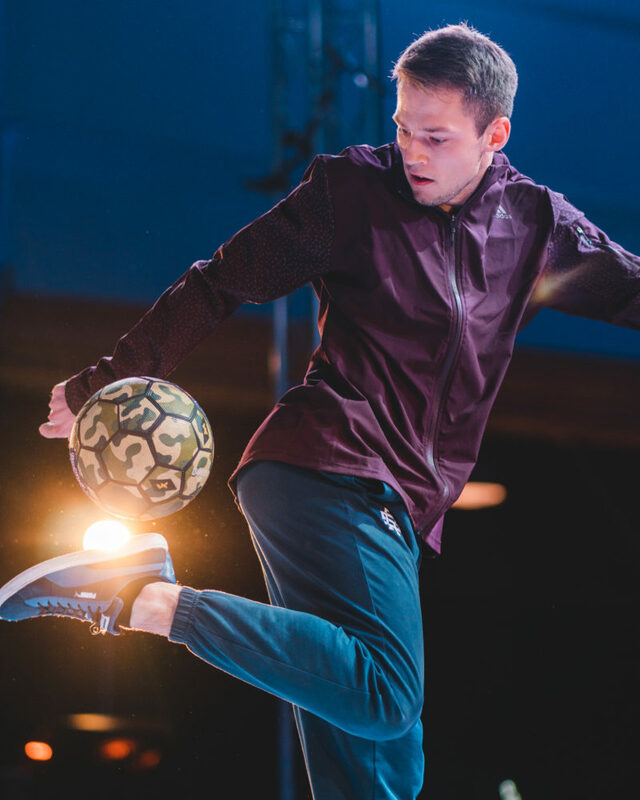 Along with fellow Polish freestyler Mael Kevin, Kala says he was the one who proposed the no time limit concept, which has become a popular installment in Polish competitions. In his eyes, putting time constraints on battles limits a freestyler’s stage presence, taking away the visceral emotions and passion of freestyle and making it more robotic. 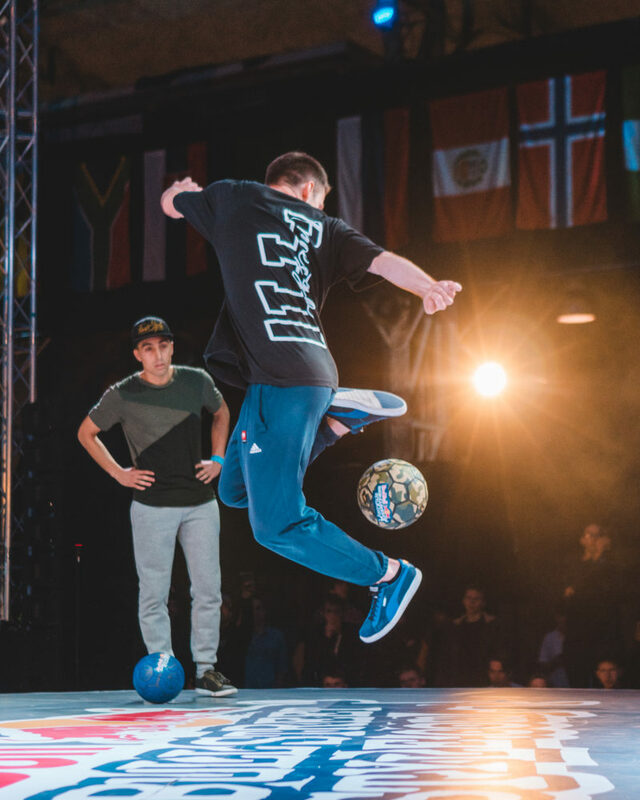 With no time limits, freestylers are free to get the crowd more involved, as well as adding an elaborate entrance and exit to their rounds. Another feature that Kala is adamant about with the no time limit system is that it gives you a chance to connect to the music that is playing in the background. Kala vs Jordan (France) in qualifiers for RBSS world finals last year. Photo by Tom Folan. 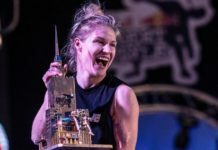 As Kala indirectly suggests, whether it’s the format or the judging system, the current setup for freestyle competitions understandably struggles to satisfy everyone. 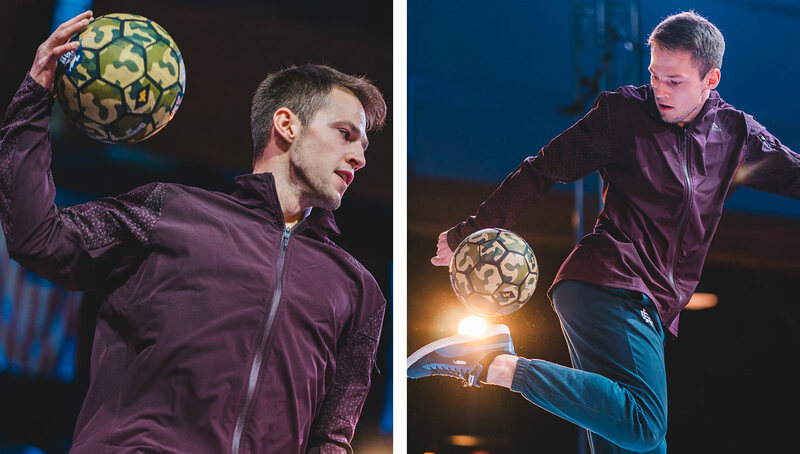 They do seem to generate a lot of discussion these days, especially when you factor in the spectators (of whom may have never seen freestyle football before) as well. Looking at the current WFFA judging system that was recently introduced, there are five categories each judge is looking for, one of which is originality. The term “originality” though can still very much be open to interpretation as Kala, one of the best regarded examples of it in the sport, explains. One of the things that sets Kala aside from the other rising number of freestylers is the way he moves. That might sound a bit simplistic and reductionist, but the tricks he does are genuinely far from the orthodox stuff we have come to see. A wide range of twists, blocks, clutches and freezes, all that no doubt have that breakdance underpinning, have helped shaped a lot of Kala’s freestyle identity. While comparing freestyle to breakdance may be a bit apples-to-oranges, the similarities of urban backgrounds and soaring popularity suggest that freestyle could learn a thing or two from breaking — a sport (and art) that is now on the verge of being considered for the Olympics. As for Kala’s own future plans, he said with a laugh that it won’t be crossbar shooting. Instead, he insisted he’ll be focused on more R-Style projects while continuing to develop his own freestyle, hopefully inspiring more people to push their own style and really kill it on stage. As for his routines, we can only expect one thing — originality. Keep up with Kala’s freestyle journey by following him on Instagram.